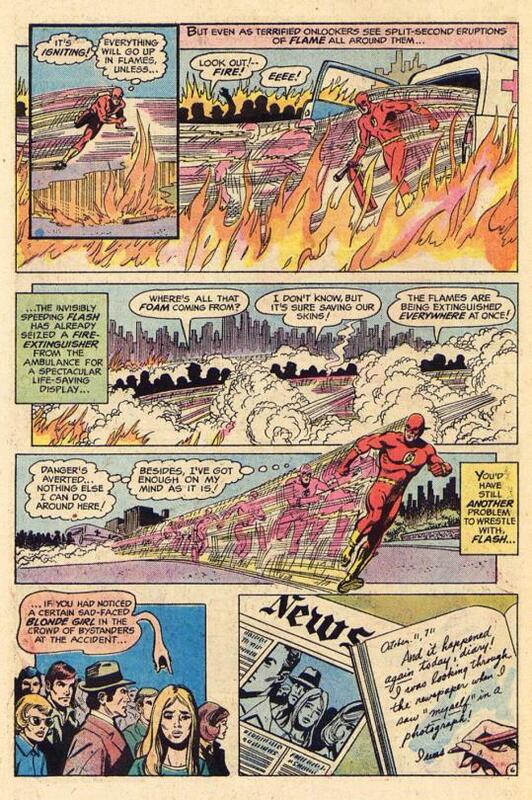 Came the mail, and another delivery of a folded-in-half issue of THE FLASH, always a welcome surprise when it turned up. It has a cover that I really don’t like. The concept and composition is good, but the reproduction of the linework is again shaky, with finer lines breaking up throughout the piece. The baby blue background is also a strange color for a super hero comic book cover. And the balloons oversell the situation, belaboring the point a bit. 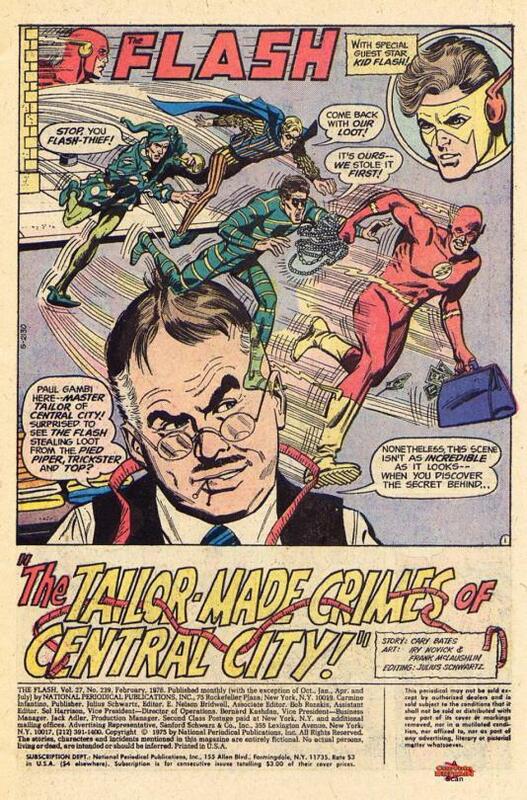 In the story, writer Cary Bates brings back an obscure part of the Flash legend: tailor Paul Gambi, who creates (or created, as he is now reformed) the colorful costumes worn by Flash’s enemies. Gambi was originally devised and named as a tribute to regular FLASH correspondent Paul Gambaccini by editor Julie Schwartz, but here whad had been done as a single throw-away appearance became a running bit. Gambi’s brother Peter would later turn up in the BLACK LIGHTNING series. 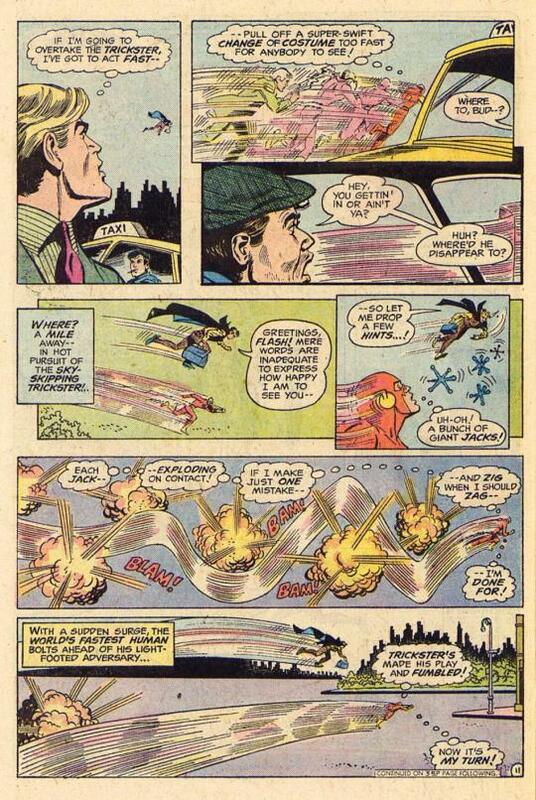 The issue opens on the Pied Piper robbing a payroll delivery, a heist which is foiled by the Scarlet Speedster. But despite wrapping the Piper up for the cops, the actual payroll itself mysteriously disappears. After leaving Police Headquarters, Flash runs straight into an auto accident, and prevents the cars from catching fire and exploding. Among the onlookers is a girl who looks like the Allens’ tenant Stacy Conwell, but Stacy herself has no recollection of being there. A mystery for another time! Elsewhere, Newly-released ex-con Paul Gambi watches a news report of Flash’s exploits with pride. 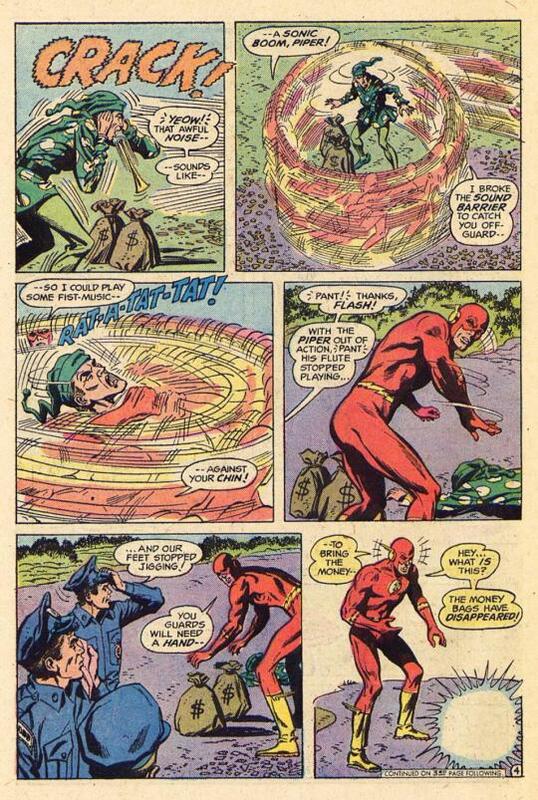 As thanks for Flash helping him to achieve parole, the now-reformed tailor-to-the-Rogues crafted a new costume for the Flash, a suggestion of Gambi’s cellmate Sam. But Gambi reveals that, despite Sam’s expectations, he didn’t booby-trap the costume in any way–he has legitimately gone straight. 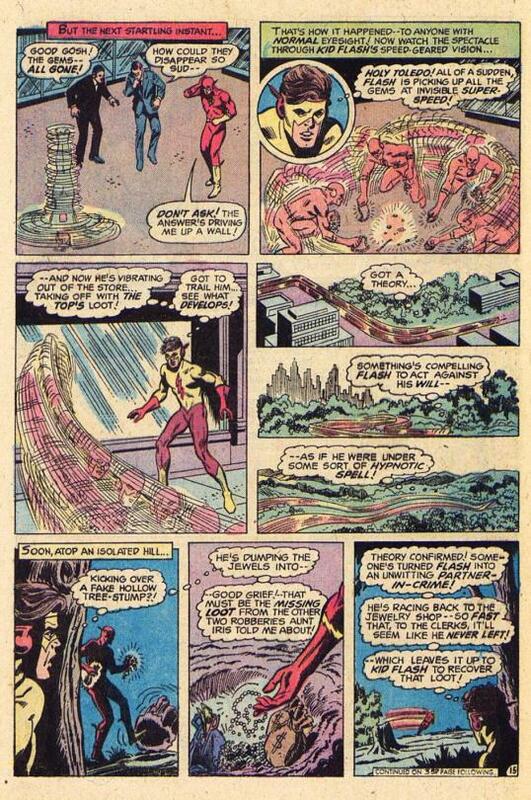 Later, Barry is on his way to keep a date with his wife Iris when he comes across the Trickster fleeing from a heist. He swiftly takes down the high-flying criminal, but again the loot disappears after he’s done so–this time between when he arrived at Police Headquarters with it and when he goes to hand it over to teh desk sergeant. 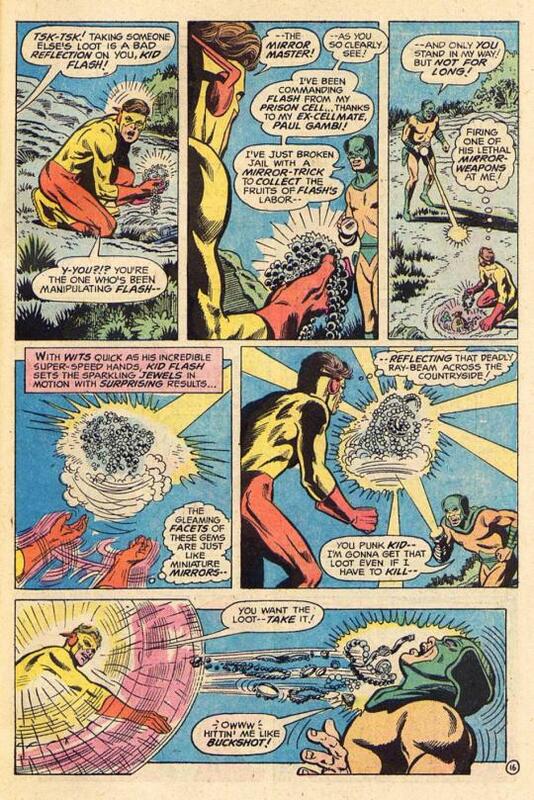 A flummoxed Flash returns home, where Iris is irate about him missing their appointment. 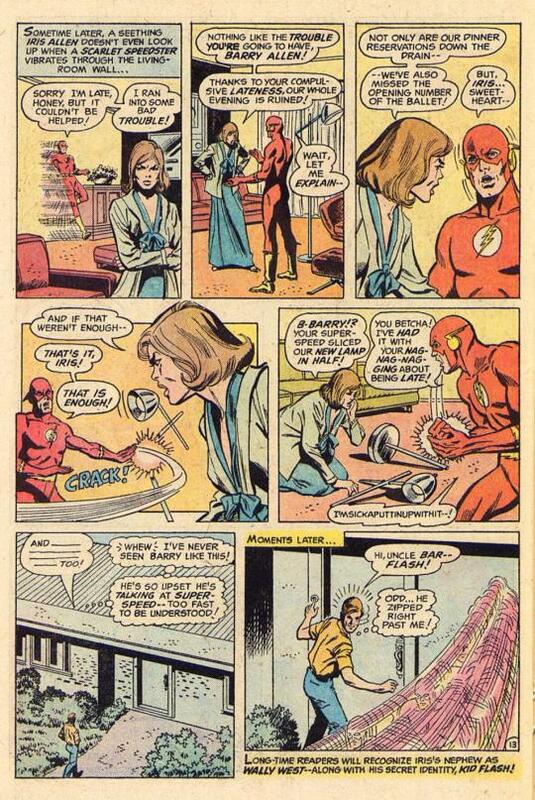 Flash reacts with uncharacteristic anger, snapping a standing lamp in half before storming out.